This homeowner wanted to build a comfortable, efficient heated barn. Larry Janesky of Dr. Energy Saver explains how the objective was accomplished. Interested in hydronic heating for your home? All hydronic heating systems have one thing in common: hot water. Hydronic heating systems provide warmth by pumping hot water to radiators, to under-floor tubing, or to heat exchangers. Dr. Energy Saver can go over the different types of hydronic heating available and explain why a certain system might work best for you. Invite your local dealer to perform a home energy audit, or schedule a free estimate for home heating installation or repairs! Baseboard. This popular hydronic system is frequently referred to as "hot water baseboard." The painted steel housing on the baseboard unit hides a hot water pipe surrounded by metal fins that help radiate the heat. Hydronic radiant floor. This heating system uses the entire finished floor as a giant radiator. Hot water is pumped through plastic tubing installed beneath the finished floor surface. A hydronic radiant floor can be installed beneath tile or wood; it can also be embedded in a poured concrete slab. It's not a wise choice beneath wall-to-wall carpet because the carpet doesn't conduct heat very well. Hydro-air heating. This heating system requires ductwork and at least one air handler. Hot water is pumped to a heat exchanger located in each air handler to warm air before it's distributed throughout the house. Hydro-air systems are usually more affordable than hydronic radiant floor heating, and they offer the advantage of a ductwork system that can also be used for air conditioning. If you're considering installing hydronic heating in your home, there are several advantages you can look forward to. People who have allergies and respiratory ailments often prefer heating with radiators or hydronic radiant floors, because these heating systems don't blow air around like forced-air heating. Additionally, hydronic heating can vastly improve home comfort. Hydronic baseboard heat and hydronic radiant floor heat warm a room from the floor upwards, rather than from the ceiling downwards, which is what forced-air heat typically does. Putting the warmth at floor level is more comfortable and more effective than having the warmest air near the ceiling. Another benefit is energy efficiency. A well-designed hydronic heating system can be very economical in terms of energy use. This is especially true when a high-efficiency condensing boiler or a tankless water heater is used as the main hot water source. For even greater savings, it's possible to install a solar thermal system that will allow the sun to do some of the water-heating work. Today's boilers are far more compact and efficient that older models. There are different ways to heat the water used in a hydronic heating system. The most common heater is a boiler fueled by natural gas, propane, or fuel oil. Some hydronic heating systems rely on heat pumps, tankless "on-demand" water heaters, solar thermal systems, or even tank-type water heaters. In any hydronic heating system, there will be a pump that moves the water, piping that conveys hot water to the living space and transports cooled water back to the heat source, and radiators that absorb and radiate heat. The thermostat is a final common ingredient. It tells the heating system when to pump hot water to the radiators so that comfortable temperatures can be maintained. Choosing the right type of thermostat is important with a hydronic heating system. 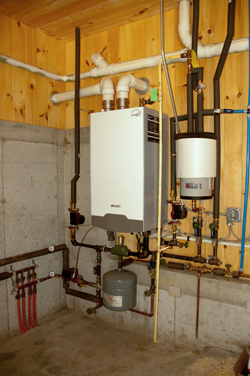 Even though there are complex elements required to make sure your hydronic heating system works at its best, Dr. Energy Saver is skilled in installing and maintaining these systems. We can help you choose which hydronic system would be the best fit for your home. Contact your local dealer by clicking below!